During the tenth anniversary of the Safe Motherhood Initiative, a series of "action messages" were articulated that summarised key programmatic priorities from the Initiative's first decade. The messages highlight the most critical interventions for reducing maternal mortality and morbidity, and the range of barriers (economic, legal, social, and cultural) that women face in accessing high-quality maternal health care. These messages have been widely adopted by national and international partners, and are echoed in a range of publications produced by the Inter-Agency Group members and other partner agencies. Each of the action messages is solidly grounded in research and country-level experiences the first three messages are directed at changing the political environment to support womens health and empowerment; the remaining seven action messages relate to health services and education. Preventing maternal death and illness is an issue of social justice and women's human rights. Making motherhood safer requires women's human rights to be guaranteed and respected. These include their rights to good quality services and information during and after pregnancy and childbirth; their right to make their own decisions about their health freely, without coercion or violence, and with full information; and the removal of barriers legal, political, and health that contribute to maternal mortality. Governments have an obligation to address the causes of poor maternal health through their political, health and legal systems. International treaties and national constitutions that address basic human rights must be applied to safe motherhood issues in order to guarantee all women the right to make free and informed decisions about their health, and access to quality services before, during, and after pregnancy and childbirth. Maternal deaths are rooted in women's powerlessness and their unequal access to employment, finances, education, basic health care, and other resources. These realities set the stage for poor maternal health even before a woman becomes pregnant, and can worsen her health when pregnancy and childbearing begin. Legal reform and community mobilisation are essential for empowering women to understand and articulate their health needs, and seek services with confidence and without delay. All national development plans and policies should include safe motherhood programmes, in recognition of the enormous cost of a woman's death and disability to health systems, the labor force, communities and families. Additional resources should be allocated for safe motherhood, and should be invested in the most cost-effective interventions (in developing countries, basic maternal and newborn care can cost as little as US$3 per person, per year). Pregnancy and childbearing during adolescence can carry considerable risks. To delay first births, reproductive health information and services for married and unmarried adolescents need to be legally available, widely accessible, and based on a true understanding of young people's lives. Community education must encourage families and individuals to delay marriage and first births until women are physically, emotionally, and economically prepared to become mothers. During pregnancy, any woman can develop serious, life-threatening complications that require medical care. Because there is no reliable way to predict which women will develop these complications, it is essential that all pregnant women have access to high quality obstetric care throughout their pregnancies, but especially during and immediately after childbirth when most emergency complications arise. Antenatal care programs should not spend scarce resources on screening mechanisms that attempt to predict a woman's risk of developing complications. The single most critical intervention for safe motherhood is to ensure that a health worker with midwifery skills is present at every birth, and transportation to a health facility is available in case of an emergency. A sufficient number of health workers must be trained and provided with essential supplies and equipment, especially in poor and rural communities. A large number of women in developing countries do not have access to maternal health services. Many of them cannot get to, or afford, high-quality care. Cultural customs and beliefs can also prevent women from understanding the importance of health services, and from seeking them. In addition to legal reform and efforts to build support within communities, health systems must work to address a range of clinical, interpersonal, and logistical problems that affect the quality, sensitivity, and accessibility of the services they provide. Each year, an estimated 75 million unwanted pregnancies occur around the world. Many women without access to safe services for termination of pregnancy resort to unsafe abortion which often results in death or disability. Unsafe abortion is the most neglected and most easily preventable cause of maternal death. These deaths can be significantly reduced by ensuring that safe motherhood programmes include client-centered family planning services to prevent unwanted pregnancy, contraceptive counseling for women who have had an induced abortion, the use of appropriate technologies for women who experience abortion complications, and, where not against the law, safe services for pregnancy termination. Governments around the world have pledged to reduce maternal mortality by 50%. 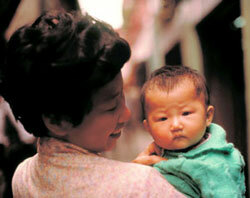 However, maternal mortality is difficult to measure, due to problems with identification, classification and reporting. Therefore, safe motherhood partners have developed alternative means for measuring the impact and effectiveness of programs; for example, by recording the proportion of births attended by a skilled health provider. These indicators can identify weaknesses and suggest programmatic priorities so that maternal deaths can be better prevented in the future. Reducing maternal mortality requires sustained, long-term commitment and the inputs of a range of partners. Governments, non-governmental organisations (including women's groups and family planning agencies), international assistance agencies, donors, and others should share their diverse strengths and work together to promote safe motherhood within countries and communities and across national borders. Programs should be developed, evaluated and improved with the involvement of clients, health providers, and community leaders. National plans and policies should put maternal health into its broad social and economic context, and incorporate all groups and sectors that can support safe motherhood.